At JCss we are in a very fortunate position where many of our coaches and advisors have played or been involved with football at the highest level. Due to this we have a fantastic list of contacts and often invite professional players, ex-professional players, high profile coaches and people from within the game to pass on advice, tips and to hopefully inspire our kids at JCss. Ex West Ham, England youth international and MK Dons defender Jordan Spence came down to visit JCss at our first ever camp. Jordan gave plenty of good advice to our JCss kids and spoke about his football and life experiences up to date. 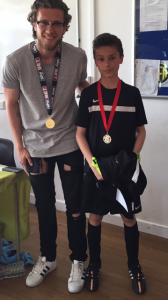 Highlighting his winning goal against Brazil for England at the youth World Cup as one of his fondest memories, Jordan’s talk went down a treat with our JCss youths. With Women’s football one of the fastest growing sports in the world, JCss were delighted to have Arsenal and England Under 19 internationals Carla and Leah come down to our Bedfordshire camp. At JCss we’re keen to promote Women’s football and who better to come and talk to our kids than two of England’s finest upcoming stars. 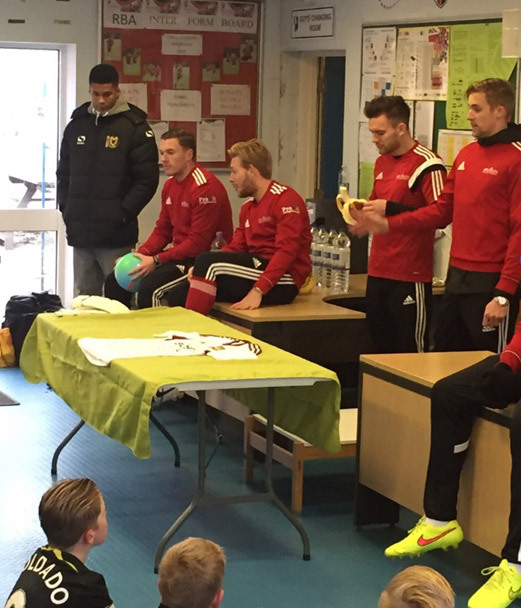 Speaking of their journey from youth to first team, JCss were delighted to offer our kids this helpful insight into making it to the very top. One of the girls has a much better goalscoring record than the other but we’ll let you find that out at one of our future Camps! 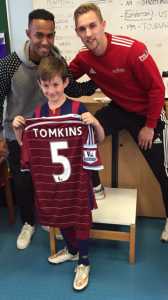 Tonks came and visited our Essex camp during Easter Half term. It’s not every day you get to pick the brains of a current premier league footballer. Our JCss kids thoroughly enjoyed grilling Tonks and even though he had a bad shoulder he still took the time to pose for photos, offer advice and have a bit of fun. We are very fortunate that we can offer these opportunities and as Tonks is a good mate of mine there is no doubt he will be down to another camp in the near future. Only days after helping guide Southend into League 1 via a thrilling cup final at Wembley. 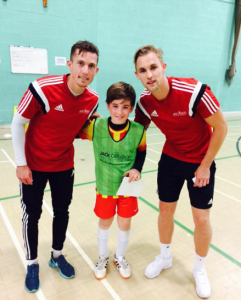 Ben Coker came down to visit both our Essex and Hitchin camps. He didn’t come single handed either, as he brought down his winners medal to show the kids. Cokes was on hand to take part in the quizzes, share some stories and also pass on some vital knowledge and advice for our aspiring footballers. His story is inspiring and definitely rubbed off on our JCss kids. Having played with Jack and Russell at youth level, Damo was desperate to come and get involved at our May half term camps. Not only did Damo speak to our JCss kids and pass on his wisdom, he also coached at both our Hitchin and Bedfordshire camps. 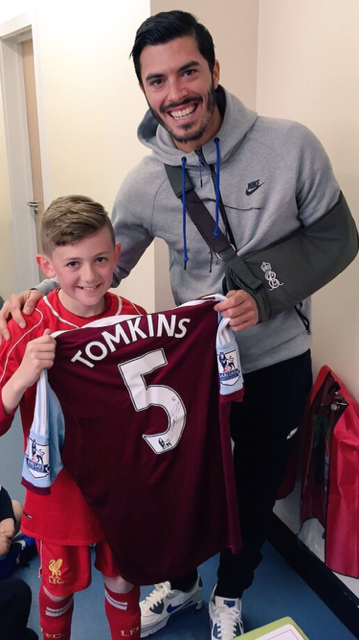 Not many young footballers get the opportunity to learn from a current professional footballer, but at JCss we try and provide a unique training environment for our kids. Damo proved a popular figure and will be looking to feature in future camps. 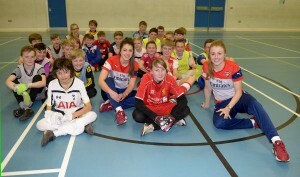 Hally visited our Beds camp during Easter half term. He played a key role in MK Dons promotion to league whilst on loan, scoring a hat trick against Leyton orient along the way. Hally was happy to answer questions and enjoyed telling the JCss kids about some of his most important goals to date. It was fantastic to have a real goal scorer give some advice on how to find the back of the net.